On a beach not far from the isolated settlement of Sydney in 1797, a fishing boat picks up three shipwreck survivors, distressed and terribly injured. They have walked hundreds of miles across a landscape whose features—and inhabitants—they have no way of comprehending. They have lost fourteen companions along the way. Their accounts of the ordeal are evasive. It is Lieuten On a beach not far from the isolated settlement of Sydney in 1797, a fishing boat picks up three shipwreck survivors, distressed and terribly injured. They have walked hundreds of miles across a landscape whose features—and inhabitants—they have no way of comprehending. They have lost fourteen companions along the way. Their accounts of the ordeal are evasive. It is Lieutenant Joshua Grayling’s task to investigate the story. He comes to realise that those fourteen deaths were contrived by one calculating mind and, as the full horror of the men’s journey emerges, he begins to wonder whether the ruthless killer poses a danger to his own family. In 1797 a fishing boat picks up three shipwrecked survivors on a beach all of whom are injured and distressed. They have walked for hundred of miles losing fourteen companions along the way their survival has come a cost. Lieutenant Joshua Grayling’s must investigate the story of the three survivors, but all is not as it seems. What these men went through to survive was an horrendous ordeal, but there trouble brewing and it seems everyone could be in danger. Preservation by Aussie author Jock Sero In 1797 a fishing boat picks up three shipwrecked survivors on a beach all of whom are injured and distressed. They have walked for hundred of miles losing fourteen companions along the way their survival has come a cost. Lieutenant Joshua Grayling’s must investigate the story of the three survivors, but all is not as it seems. What these men went through to survive was an horrendous ordeal, but there trouble brewing and it seems everyone could be in danger. Preservation by Aussie author Jock Serong was a bit of a surprise for me as I didn’t think I’d enjoy it, as much as I did. A great mixture of historical fiction, Intrigue, mystery and crime all of these combined together makes for a very interesting and enjoyable read. With thanks to Text Publishing for my ARC to read and review. Robinson Crusoe meets Silence of the Lambs meets that old primary school song we all learned about Botany Bay. This one is based on the true story of a shipwreck back in Australia's early (settlement) days, and man, is it a doozy. The ship wrecks off the coast of Tassie Van Diemen's Land and a handful of men decide they need to make tracks towards Sydney in hopes of sending help. They take a bunch of slaves and don't even get me started ranting about slavery. Let's just say I'm glad this was 200+ Robinson Crusoe meets Silence of the Lambs meets that old primary school song we all learned about Botany Bay. This one is based on the true story of a shipwreck back in Australia's early (settlement) days, and man, is it a doozy. The ship wrecks off the coast of Tassie Van Diemen's Land and a handful of men decide they need to make tracks towards Sydney in hopes of sending help. They take a bunch of slaves and don't even get me started ranting about slavery. Let's just say I'm glad this was 200+ years ago. So among them is Figge, who is basically the devil incarnate, and while everyone is trying their best to survive in the formidable Australian bush, this guy has his own agenda that makes things a lot harder than they need to be. So here we have: - Hostile environment - Discord among survivors - White people being jerks to slaves - Long, arduous trek - Sneaky little criminal mastermind So it's actually really fun and devious and I can't lie, I enjoyed it immensely. The writing threw me at first. I was worried that it was going to be one of those books that works so hard to say things in fancy convoluted ways that I'd be bogged down by the language, but it had just the right blend of description and action. There were actually some beautiful, picturesque phrases and the words really brought the setting to life. This will be particularly effective if you've ever been out into the Australian bush, but it also paints a very clear, realistic picture for people who might want to know more about Australia. The story is told from multiple viewpoints, which was quite effective in amping up the mystery factor, because you don't know which parts are lies and which parts are truth. They take turns in telling the tale of the trek north, but all slight variations. It did make it a little confusing at times but I think that was kind of the point. Wasn't entirely sure about the necessity of including all the present-day drama with the wife and the illness etc but I guess it was just another facet of life in this new and strange land. Naturally, the aboriginal communities were a big part of this story. I found it interesting the way they were portrayed, particularly in the way they associated preferentially with the slaves. I think that was a powerful statement. It's also quite a vital piece of Australia's history - to communicate that these people were already here, living full lives with their own social systems, not wanting anything, all before white settlers went tromping all over, claiming the country for themselves. It wasn't a pushed agenda, though; it was just a realistic factor of the story. Handled poorly, this could have caused massive controversy I think, but it was written into the story with great respect, so kudos to the author for that. This is a fascinating fictionalised account of a small piece of Australia's early history, but it's also a great, sinister novel on its own. I loved the references to Australian wildlife (particularly the 'fat badgers') and I felt such patriotism reading about this hostile environment that only the tough survive. That's my country! You also get to know these nasty characters - Figge in particular is such a subtle menace that it makes for a ripper of a story. Well researched and eloquently written, I have no hesitation in recommending this one. Crime lovers, people who want to know more about Australian history, or the landscape in general. People who like adventure stories tinged with a little bit of evil. Overall, a fantastic read. With thanks to Text Publishing for my ARC. It was 1797 and Lieutenant Joshua Grayling was captivated by the eyes of the terribly injured Figge – his demeanor was strange to say the least; his story even stranger. From what he was told, the Sydney Cove had foundered on the rocks of Preservation Island, and the survivors had walked hundreds of miles until they were picked up near Sydney. The fourteen who had died along the way had apparently suffered – but Figge’s descriptions were random and didn’t make a lot of sense. William Clark was a It was 1797 and Lieutenant Joshua Grayling was captivated by the eyes of the terribly injured Figge – his demeanor was strange to say the least; his story even stranger. From what he was told, the Sydney Cove had foundered on the rocks of Preservation Island, and the survivors had walked hundreds of miles until they were picked up near Sydney. The fourteen who had died along the way had apparently suffered – but Figge’s descriptions were random and didn’t make a lot of sense. William Clark was another of the three survivors… Grayling’s wife, Charlotte, although ill, talked to her husband about the survivors, offering insights and suggestions. But as Grayling continued his interviews plus readings of Clark’s diary, he began to feel there were untruths and differing opinions from the men. What had happened to those fourteen men who didn’t survive the journey from the ill-fated Sydney Cove? Was Grayling uncovering a ruthless killer? Preservation by Aussie author Jock Serong is another intriguing historical mystery novel; the story taken, researched and embellished from newspaper archives regarding the story of the Sydney Cove; the wreck of which lay undiscovered until New Year’s Day, 1977, 180 years after its demise. A fascinating look at history which I recommend. With thanks to Text Publishing for my ARC to read in exchange for an honest review. I've spent a few days tossing up between 3 or 4 stars; now I've settled on 4 because although I didn't like many of the characters or a lot of their actions, it was actually a really good story, well-written. I always enjoy historical fiction based on a little bit of fact. In this case it's more than a little bit, because the shipwreck (of the Sydney Cove) did occur on Preservation Island in Bass Strait, and there is a secondary source supporting the existence of Clark's diary. But all the rest i I've spent a few days tossing up between 3 or 4 stars; now I've settled on 4 because although I didn't like many of the characters or a lot of their actions, it was actually a really good story, well-written. I always enjoy historical fiction based on a little bit of fact. In this case it's more than a little bit, because the shipwreck (of the Sydney Cove) did occur on Preservation Island in Bass Strait, and there is a secondary source supporting the existence of Clark's diary. But all the rest is Jock Serong's trademark powerful storytelling. I also note that it's an unusual treat to be able to read fiction set so early in Australia's history. In 1797, the colonising population of Sydney was still only about 4,000, so infrastructure, exploration and social systems were still in their infancy. It was really interesting to read about the tenuous grasp of Governor Hunter on his authority, and the tension between the government and the military, with Macarthur beginning to make his move. I think the decision to tell the story as an investigation into the veracity of the diarised events was a brilliant one, allowing these other elements to be highlighted. As for the exploits of the shipwrecked party, there's nothing I can add that the blurb doesn't already say. However I would like to mention that the character Mr Figge is perhaps the most despicable and monstrous literary figure I've come across in a very long while. His methods of dominating the other survivors can become extremely graphic at times, and some readers may find this distressing. A great book to read, but not necessarily to enjoy. 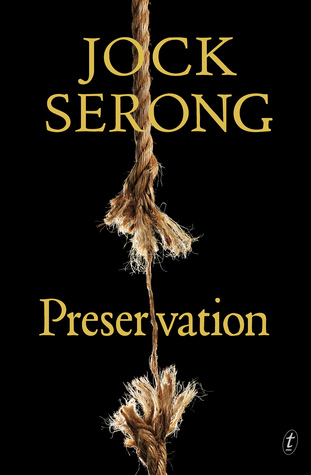 Preservation is the fourth novel by Award-winning Australian author, Jock Serong. From the archive of a newspaper named The Asiatic Mirror, we know that a tri-masted country trader, the Sydney Cove, filled with goods including quite a lot of rum, left Calcutta in November of 1796, headed for New South Wales on a speculative venture, and was wrecked on Preservation Island in Bass Strait in early 1797. One of those on board, William Clark wrote an incomplete diary, extracts of which were quoted in Preservation is the fourth novel by Award-winning Australian author, Jock Serong. From the archive of a newspaper named The Asiatic Mirror, we know that a tri-masted country trader, the Sydney Cove, filled with goods including quite a lot of rum, left Calcutta in November of 1796, headed for New South Wales on a speculative venture, and was wrecked on Preservation Island in Bass Strait in early 1797. One of those on board, William Clark wrote an incomplete diary, extracts of which were quoted in said newspaper. Serong takes the bare bones of these facts and fleshes them out. After the wrecking, seventeen men take the longboat, intending to reach Sydney and initiate a rescue of the remaining crew and salvage of the rum cargo. Mere days later this boat, too, is wrecked, and the men, with what goods they have been able to recover, head on foot for Sydney, some five hundred and fifty miles. Not quite three months later, three survivors are picked up by a fishing boat just south of Sydney. On Governor Hunter’s instruction, Lieutenant Joshua Grayling questions two of the survivors: William Clark, who is supercargo for the shipping company; and Mr Figge, who purports to be a representative of a tea merchant. Srinivas, a Bengali lascar, is Clark’s manservant and assumed to speak no English. Charlotte Grayling listens to her husband’s account of the interrogation of the survivors, asking pertinent questions and offering insightful observations. Each of these five distinct narratives is denoted by its own apt icon both at each start and beside the page count. It soon becomes apparent that each of these survivors is not being entirely forthcoming, and that Clark’s journal does not give the full facts, even where the facts recorded are actually true. What they are hiding, and why, becomes the object of Grayling’s interviews with the men. Serong’s characters are much more than one-dimensional, and he gives some of them perceptive reflections: “…not only do they have the run of the land, the miles that might stretch between one man and another, but they put their homes where they want them for the seasons. To be rich, I had thought until then, was a walled place. But now I wondered if being rich meant not needing the wall.” Serong’s depiction of the attitudes of the white settlers to the indigenous people is realistic. Serong states in his Author’s Note “Perhaps all of this is history, and none of it” so the reader will understand that not all the of the story that follows may align strictly with known facts. But his imagining is both fascinating and eminently believable. He includes three very useful maps and the depth of his research is apparent on every page. Once again, an utterly brilliant read! 2.5 - 3 This book was read over my summer Xmas holidays and is a good enough "beach read". I had purposely picked this one out with the hope it would be an Australian version of The North Water and there are some parallels, - disaster at sea, psychopaths and descriptions of violence I would be happy to have removed from my brain. However, where as The North Water left me pondering the nature of man in interesting ways, Preservation has left only the most vague of impressions about what it 2.5 - 3 This book was read over my summer Xmas holidays and is a good enough "beach read". I had purposely picked this one out with the hope it would be an Australian version of The North Water and there are some parallels, - disaster at sea, psychopaths and descriptions of violence I would be happy to have removed from my brain. However, where as The North Water left me pondering the nature of man in interesting ways, Preservation has left only the most vague of impressions about what it might be like to walk along the coastline from Melbourne to Sydney with people you don't like much. While the story starts out strongly, some of the narrative tension is squandered given we know early on who survives the ordeal. I grew restless going back over the entire survival story from different points of view. Based upon a very interesting piece of maritime history, I think the story was intriguing enough without the need to gussy it all up in this fashion. Thanks to Text publishing for my free copy. I have never read this author before. Firstly fantastic I was thoroughly enthralled but couple of times I wander off from a slow pace of story telling. Overall though a very intriguing story (the actual event of the wreck of the ship the Sydney Cove) with good characters and some creepy ones. I was a bit sceptical with reading Australian history, only because I have been sucked in before thinking it would be a fairly even playing field only to discover Thanks to Text publishing for my free copy. I have never read this author before. Firstly fantastic I was thoroughly enthralled but couple of times I wander off from a slow pace of story telling. Overall though a very intriguing story (the actual event of the wreck of the ship the Sydney Cove) with good characters and some creepy ones. I was a bit sceptical with reading Australian history, only because I have been sucked in before thinking it would be a fairly even playing field only to discover it was simply a book to reinforce colonialism and colonial history. Thankfully this book does not do this. As you would expect there is racism etc but that was the attitude of the time, my only concern it will continue to maintain those attitudes. However if readers read this novel with a good history mystery/ thriller in mind then I dare say you will enjoy as I did. I read this over Christmas and I'm still trying to come to terms with it. My reading was very interrupted so I did not get a good run at it. I enjoyed the story, loved to hate the villain, but didn't feel connected to the story or the chatacters in any way and couldn't wait to finish (which happens to any book I read that takes more than a week to read). Not sure if it was the book or my reading circumstances. There was certainly a good feeling of place and some lovely descriptive prose. A magnificent adventure, with some serious food for thought about Australian history, collective responsibility and the fragile bonds of civility. Just great. Thank you to Text Publishing for an advance copy of this excellent novel. After being blown away by Jock Serong's "The Rules of Backyard Cricket" - my favourite book of 2016 - I quickly devoured "On the Java Ridge" when it was released before heading back to where it all began by reading his Ned Kelly Award-winning debut novel, "Quota". What has impressed me most about Serong, including his newest novel "Preservation", is how all four books are about such vastly different worlds and the vastly d Thank you to Text Publishing for an advance copy of this excellent novel. After being blown away by Jock Serong's "The Rules of Backyard Cricket" - my favourite book of 2016 - I quickly devoured "On the Java Ridge" when it was released before heading back to where it all began by reading his Ned Kelly Award-winning debut novel, "Quota". What has impressed me most about Serong, including his newest novel "Preservation", is how all four books are about such vastly different worlds and the vastly different characters who populate them. The level and depth of research is clear on every page, and the social commentary is insightful and thought-provoking. "Preservation's" era, so close to the initial landing of the First Fleet, is a unique setting for an engaging and informative narrative which should become canonical over time. If the Queensland senior high school English program wasn't moving to a set text list next year, I would seriously consider using it (and "On the Java Ridge") as fascinating texts for students to study. Based on early Australian settlement history. Didn’t appear to be realistic and a vague ending. Very pleased to have received this book as a gift, and what a tale it was! Historical fiction centered on the wreck of the Sydney Cove in 1797 off the coast of Tasmania on an island now known as preservation island. The remains of the wreck were rediscovered in 1977. Survivors of the wreck took a long boat with the aim of sailing for Sydney, but were also wrecked and they were then faced with a walk to Sydney. The ship originated from Calcutta and had Indian sailors (lascars) among their party. Very pleased to have received this book as a gift, and what a tale it was! Historical fiction centered on the wreck of the Sydney Cove in 1797 off the coast of Tasmania on an island now known as preservation island. The remains of the wreck were rediscovered in 1977. Survivors of the wreck took a long boat with the aim of sailing for Sydney, but were also wrecked and they were then faced with a walk to Sydney. The ship originated from Calcutta and had Indian sailors (lascars) among their party. 3 survivors of 17 made it to Sydney. What Jock has imagined is a tale of sabotage, murder and scheming with some great characters in here. However, what I found most intriguing was the tug of colonial arrogance and the depth of aboriginal society portrayed. I thought it was expertly done. All throughout are references to the harmonious society of our indigenous people compared to the depravity, disease and ignorance of early colonial civilization. 5 Stars. What a marvellous tale this is---and a part of our history that I had not heard about. I loved the 'first person account' nature of the narrative---three or four different voices each giving their version of events. And what richness in the writing--my first experience of Jock Serong, but not my last. A great story ,superbly written. Ripper of a yarn, and hard to put down once you pick it up. Loved how it’s told from multiple perspectives - definitely adds to the darkness and mystery, as you’re never quite sure who’s ‘truth’ is correct. Preservation has been a real journey in every way. Harrowing at times but also wonderful. Giving new light onto our Australian history is important and this book has rightful respect for our First Australians showing a different history to the one given by those in power. I love this book for that. I had loved The Rules of Backyard Cricket so I got pretty excited when I found out I won a copy of Preservation (thank you Text Publishing!) and it didn't disappoint. Cleverly constructed, an interesting mix of characters (possibly the most despicable man in literature in Mr Figge)... you'll struggle to put it down. Like his previous books, Jock continues to write with gripping narrative and a pace that urges you to read quicker. A deeply themed novel with a harsh but beautifully drawn landscapes, and despite one brutal scene I had to speed read through, I consumed this novel in a matter of days. Excellent novel, the descriptions are fantastic. I felt like i was experiencing the same ordeal as the characters. The characters are interesting, scary and engaging. I was engrossed in the storytelling and really enjoyed the historical aspect. I can't wait for the sequels. This historical novel is set in the colony of New South Wales in 1797. It tells the story of a ship wreck and the survivors. It is based on the true story of the wreck of The Sydney Cove, coming from India to Sydney laden with trade items, including tea and rum. The ship is wrecked somewhere in Bass Strait and the survivors make their way by foot to Sydney, helped by the First Nations people they meet on the way. This is a wonderfully written portrait of the early years of colonization. the char This historical novel is set in the colony of New South Wales in 1797. It tells the story of a ship wreck and the survivors. It is based on the true story of the wreck of The Sydney Cove, coming from India to Sydney laden with trade items, including tea and rum. The ship is wrecked somewhere in Bass Strait and the survivors make their way by foot to Sydney, helped by the First Nations people they meet on the way. This is a wonderfully written portrait of the early years of colonization. the characters are well drawn, some of them brutal and dishonest, some of them just trying their best. Highly recommended, but not a light read. A gripping work of historical fiction based on the true story of the wreck of the Sydney Cove at the island of Preservation Island in the eastern Bass Strait in 1797. The events leading up to and following the wreck are explored in a non-linear narrative. The character of John Figge is one of the most chilling depictions of evil I've ever read. I understand Jock Serong's books to date have been in the crime fiction genre - I regard his latest book to be a very well researched, richly evocative f A gripping work of historical fiction based on the true story of the wreck of the Sydney Cove at the island of Preservation Island in the eastern Bass Strait in 1797. The events leading up to and following the wreck are explored in a non-linear narrative. The character of John Figge is one of the most chilling depictions of evil I've ever read. I understand Jock Serong's books to date have been in the crime fiction genre - I regard his latest book to be a very well researched, richly evocative foray into the historical fiction form. Where do I begin? Put simply, this is a historic novel, based on a true incident that occurred in 1797. A ship, the Sydney Cove, bound for the new colony of Sydney, is shipwrecked near Preservation Island in Bass Strait, with all on board surviving. They are stranded on a part of the coast that has not yet been mapped and there is little hope of being rescued. It is decided that a party of seventeen will set off in a longboat to reach Sydney and have a rescue ship sent back to collect the rest o Where do I begin? Put simply, this is a historic novel, based on a true incident that occurred in 1797. A ship, the Sydney Cove, bound for the new colony of Sydney, is shipwrecked near Preservation Island in Bass Strait, with all on board surviving. They are stranded on a part of the coast that has not yet been mapped and there is little hope of being rescued. It is decided that a party of seventeen will set off in a longboat to reach Sydney and have a rescue ship sent back to collect the rest of the survivors and the important cargo - illicit rum. Then this boat is also shipwrecked, leaving them no alternative than to trek the remaining 500 miles on foot. Three months later, three survivors, barely alive, are discovered just short of Sydney. The story, in of itself, is a corker! But the skill of the telling of this tale by Jock Serong takes it to another level altogether. It is told by different narrators, some reliable, some not so! All these characters are well developed with unique voices that are not mere caricatures. It doesn’t take long for the real villain in this extraordinary tale to be revealed. We never learn the true identity of this nameless man, for he steals identities (and lives) with impunity. Early in the book we witness his butchering of the real Mr Figge, the tea merchant who was to travel aboard the Sydney Cove. As I look back on the novel, I realise that all the pages I’ve marked to revisit refer to descriptions of this man - he is the devil incarnate, and Serong skilfully conveys different people’s reactions to Figge to illustrate this: Lieutenant Joshua Grayling: ’The man was a lamp that flared in response to changes in the air.’ Srinivas, the young Bengali boy: ’That voice, pouring English like a strange oil. And those eyes, I cannot think how to describe them but they were night-eyes.’ Grayling again: ’Figge’s battered face…was a sea of crossing currents: kindness and compassion and empathy, rippling the surface of darker waters through which he could see the half-lit backs of malevolent creatures, large and slowly circling.’ Figge describes how he slaughtered a female ‘badger’ and then it’s young, with such relish, it was quite appalling. He was similar to Hannibal Lector, without the charm! Sorry to harp on about this character, but he took my breathe away and he will haunt me, I’m sure. Something I wasn’t expecting was the sympathetic and compassionate portrayal of the native Australians. I learnt a lot from this book without being made aware that I was. Serong’s empathy for the mixed feelings that the indigenous Australians must have felt is beautifully conveyed. As a white Australian, it made me cringe at the way they were treated by the early settlers. It made me understand how much damage has been done, and how hard it will be to repair and make amends for this damage. ‘He watched the natives in the clusters of their endless conversation….Were they discussing the settlers, the growing predicament they represented? Or something else entirely, a thing they had been discussing since before anyone arrived? If that was so, how long had the discussion been going on? There was a great precipice, a gulf behind the arrival of the fleets: like trying to think of eternity but without the comfort of God’s presence.’ Parts of this novel are harrowing and gut wrenching, and it is not recommended for the squeamish. However, it is highly recommended for anyone who enjoys a cracking good historic novel that will have them turning the pages well past their bedtime. Australian author Jock Serong never does the same thing twice. He has gone from corruption in sport in The Rules of Backyard Cricket to a political thriller in On the Java Ridge and now to historical investigation in Preservation. But in each case he shines a light on some aspect of Australian life or, in some respects the Australian condition. In Preservation, besides being a cracking tale of survival, betrayal and psychopathy, Serong explores the earliest days of the colony of Sydney. Preservat Australian author Jock Serong never does the same thing twice. He has gone from corruption in sport in The Rules of Backyard Cricket to a political thriller in On the Java Ridge and now to historical investigation in Preservation. But in each case he shines a light on some aspect of Australian life or, in some respects the Australian condition. In Preservation, besides being a cracking tale of survival, betrayal and psychopathy, Serong explores the earliest days of the colony of Sydney. Preservation is based on a true story. In 1797, a boat called the Sydney Cove running rum into the fledgling colony of Sydney (rum being a currency at that time) from India, runs aground on a tiny island just north of Tasmania. A group of seventeen, including four Englishmen and thirteen Lascars, leave the rest of the survivors behind on the island to go for help. They founder off the coast of Victoria, make land and then proceed to walk the fifteen hundred kilometres to Sydney. Only three survived the walk. Serong builds his tale around these three but also their interrogator, Grayling and his wife, who has been struck down by a debilitating illness. It emerges early on, at least for the reader, that one of the survivors is not who he says he is, a psychopath called Figge (an identity he assumed in India to get aboard the ship), who delights in manipulation and the pain of others. The other two are Clark, the owner of the boat, who has kept a diary of their journey, and his Bengali servant who never reveals to the others that he can understand them as they plot on the journey. Using these three, Serong has taken what is already a fairly incredible story and manages to dramatise it further, using some familiar crime fiction tropes to increase the tension. Serong immerses readers in the early colony of Sydney, wild and on the edge of revolution, hemmed in by bushland, the colonists constantly trying to understand and dominate the land and its people. At the same time he charts the journey of the Sydney Cove survivors up the south eastern coast of Australia and their first encounters with the indigenous inhabitants. Some of this feels a little anachronistic, the survivors seeming to understand more about the way tribal boundaries and language work than might have been possible. But the men did survive only with the help of the indigenous communities that they met on their odyssey so some level of understanding must have been reached. Serong captures the coastline, the forests and beaches of the south-eastern coast of Australia with great skill. Even today, a walk like the one described with only the supplies and provisions that these men had would be a spectacular feat. But given what they had to deal with, the fact that anyone survived is close to a miracle. Serong manages to breathe significant life into what is already a fascinating period if Australian colonial history. Preservation is totally engaging historical fiction.